Ronald Darby has been a consistent performer both with the Buffalo Bills (2015-16) and in the last two years in with the Philadelphia Eagles (2017-18), earning 68.3-plus overall grades every year of his career. 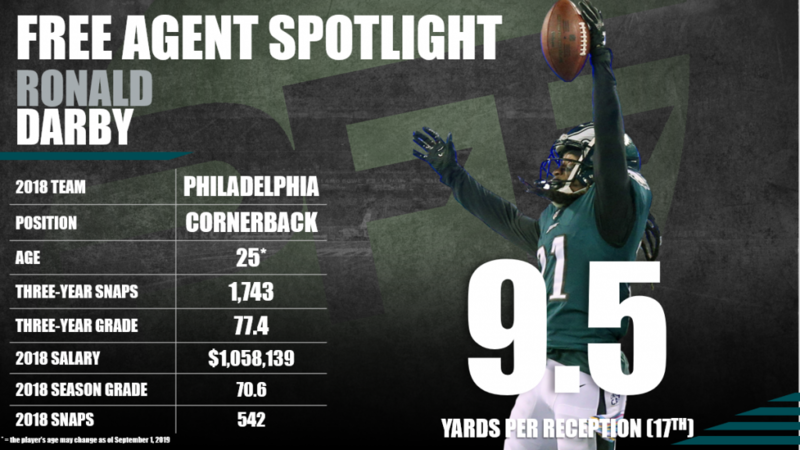 Darby earned a career-high 78.3 overall grade in 2017 and could return to such form if his health allows in 2019. He missed the final six weeks of the season and the Eagles’ two postseason games with a torn ACL last year. Subscribe to Pro Football Focus’ ELITE subscription to research Ronald Darby’s grades, advanced stats, snaps and more in Premium Stats 2.0.